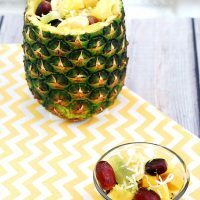 With flavors of pineapple, coconut, mango and lime, you’ll transport yourself to the Caribbean with this easy tropical fruit salad. My mom and I joke that we were born in the wrong country. We love tropical everything. Tropical flowers, tropical weather, tropical music, and especially tropical flavors. If you walked into my mother’s basement, you’d think you’d been transported to the Bahamas. Turquoise paint on the walls, coral paint in the bathroom, and palm trees everywhere. When I read that this week’s Sunday Supper theme was tropical food, I really couldn’t make up my mind. Should I make something with coconut? Something with pineapple? Something with mango? I finally decided to go super simple, and combine all the flavors in one delicious, easy fruit salad. When I was a kid, my grandmother used to hollow out a watermelon to use as a serving vessel for fruit salad at family picnics. I decided to do the same with a pineapple to serve this fruit salad. One pineapple will not hold all of the fruit salad at once, and to be quite frank, it was HARD WORK to hollow out just one pineapple. 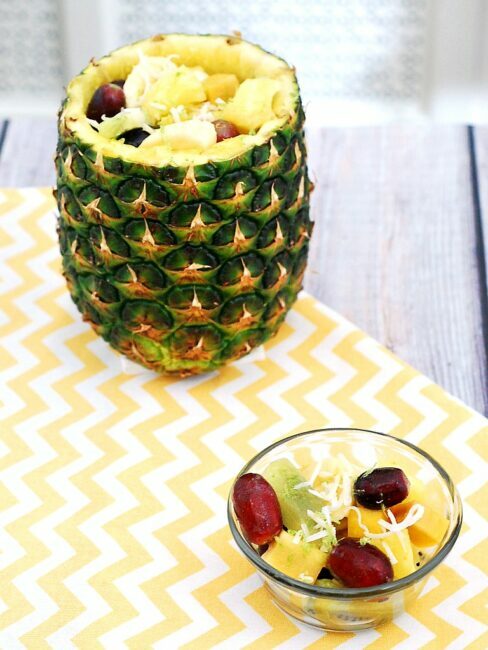 If you serve this at a party, you’ll need to keep the rest in a bowl nearby, or refill the pineapple as needed. Or you can skip the hollow pineapple altogether, and just peel and core the pineapple, and proceed with Step 4. One tip: bananas oxidize (turn brown) after being cut. Leave those until last, and toss with a little lime juice before adding to the salad. Feel free to leave out any tropical fruits you don’t like, and /or add in other tropical fruits, like oranges, papaya, or starfruit. Make the syrup: Place the sugar and water in a medium saucepan. Over high heat, bring to a boil, stirring occasionally. Once the mixture boils, stir in the coconut, remove the saucepan from the heat, and cover. Let stand for 30 minutes to 4 hours (the longer it sits, the stronger the coconut flavor). Strain the syrup into a 2-cup measuring glass (or storage container, if not using immediately). Cool to room temperature, then refrigerate if not using immediately. Discard solids from the strainer. Syrup can be stored for up to a day before using. Use a pineapple cutter to hollow out the pineapple, stopping about 3/4-inch from the bottom. Remove the flesh, discard the core. Cut the flesh into 1-inch wedges. 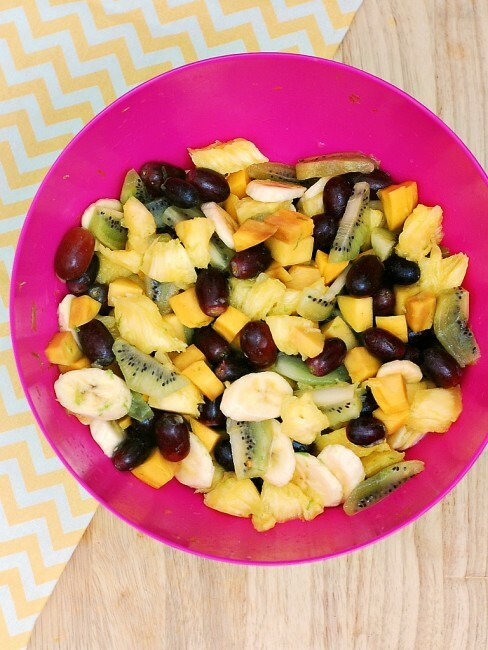 Combine the pineapple, mango, kiwi, banana, and grapes in a large bowl. Pour the syrup over the fruit, then sprinkle on the lime zest. Toss to coat. Chill in the refrigerator if not serving immediately. Discover more Sunday Supper Tropical Recipes! What a fabulous fruit salad! I adore everything about it—all my favorite fruits! 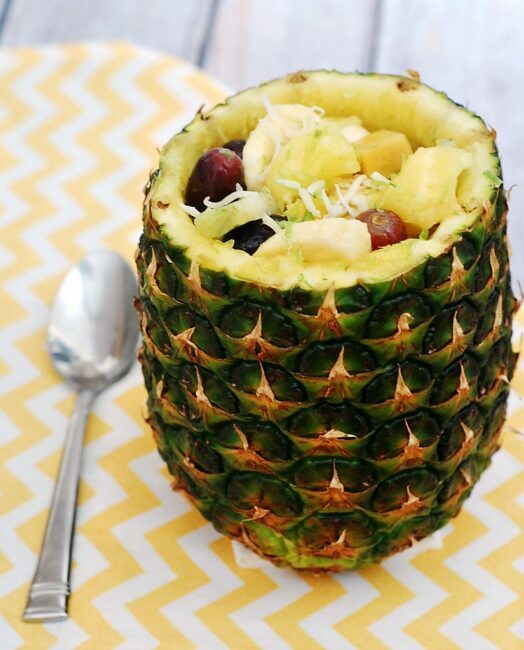 The fruit salad is great and putting it in the pineapple just makes it the bomb! How awesome. Love fruit salads and this totally screams tropics to me! !Looks lovely in the pineapple! My mom and I always joke that I was born into the wrong family since I want to live in California and be a writer and we have literally no connections. My mom made fruit salad all the time when I was a kid, but never with a syrup like this. I think that would really bring everything together. A perfect “lighter” dessert! The presentation is lovely! Great idea serving this in a pineapple. So pretty! Fruit salads are always a big hit around here. LOVE the pineapple bowl! Great salad, would be a great post-bed snack… but maybe I’m just saying that because I could really go for something refreshing right now… at 10 pm. Fresh fruit is one of my favorite things to eat in the tropics. I bet a bite of this tastes like being transported back to a beach somewhere. Love it! Your tropical fruit salad looks fantastic Coleen! I especially dig that your use a pineapple to serve it in! What a great choice for the tropical theme! I know it was hard to hollow out the pineapple, but it looks incredible! I love the idea of adding coconut to the fruit salad!